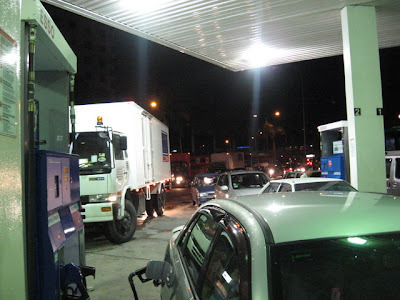 I received a sms from my brother, Albert, at about 7.30pm yesterday telling me that the fuel prices will be increased to RM2.70 from RM1.90 per litre whereas diesel will be increased to RM2.58 from RM1.58 per litre at midnight following a cut in fuel subsidy. At first I thought he must be joking cos we only expect any changes on fuel prices in August. So after a second thought, Clet said it could be right as we did not listen to the news that evening. 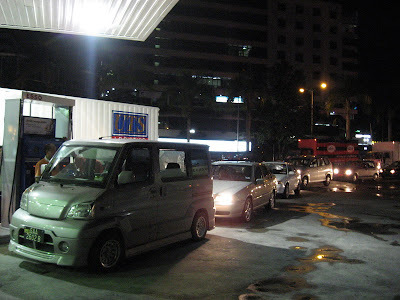 Minutes after confirming the price hike a phone call away from Albert, we rushed out to fill up our humble car's empty petrol tank in order to save RM43.37 (to be exact) of our hard earn money before midnight. 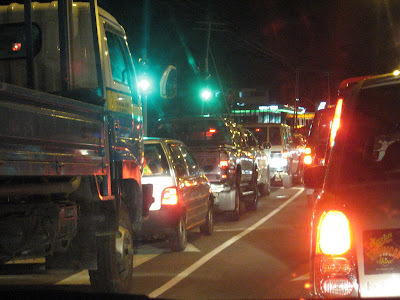 The traffic was terrible due to the queues leading to all the petrol stations in the city. It created a havoc in the city where everyone was trying to save their petrol money in the last few hours. The move to increase fuel prices and the call to Malaysians from the PM to change our lifestyle and spend more prudently (spend less in a way) will in return hit the businesses and Malaysian's economy as a whole. It's indeed a very sad news to many of us who are already struggling to meet our pressuring financial obligations. :(*** Many have voiced out their views and demonstrations are every where to protest the prices hike. Would that make any differences at all??? what do you think??? Impatient drivers trying to jump queues by entering from the exit of the Shell station opposite Taman Fortuna. 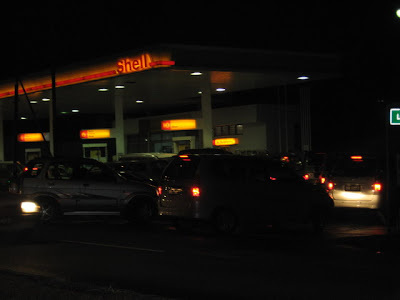 A terrible traffic jam along Penampang Road leading to Petronas and Shell stations opposite Taman Fortuna. Another traffic at Esso station next to the Inland Revenue Building in Karamunsing. Still a long queue at the back of us waiting for their turns to fill up their tanks. yes this is going to be very tough for us all...not only fuel but also the price of food. Every cents counts now. I was discussing with my hubby and friends in the office that we might use public transportation to office..peduli la org cakap kan hehe.. The Ruling BN Gov't did not keep their words in their election manifesto. They cheated almost every Sabahan who voted for them. You all should have voted for PKR, DAP or even PAS!Did not not hear that if the opposition parties win,they would reduce the price of fuel. It is definitely corect, correct, correct! We are Oil producing country ma! (Petronas's money is the Rayat money!). Where has all the money gone to? Next time round " BE SMART" in making a decision for the box. I saw the news today saying that the transportation company is going to increase their rate by 45% there is no surprise everything else will be increased. couldn't agreed more. Welcome back to my blog again.